The best way to protect your Aussie from these nasties is to make sure their vaccinations are up to date. Those that you can't vaccinate against you should be aware of so you can catch the symptoms as early as possible. The sooner your veterinarian can diagnose and treat for these diseases the better. Rabies is one of the most frightening and deadly of diseases affecting dogs and their owners. It is always fatal after symptoms appear as the rabies virus attacks the brain causing inflammation. After initial infection the rabies virus grows in the muscle tissue and slowly spreads to the spinal cord, central nervous system and brain. During this period which can last a few days or even months the dog will appear normal. Eventually, usually 1 - 3 months, the virus makes its way to the brain. At this point we begin to see the classic signs of rabies. Change in tone of bark, fever, behaviour change, restlessness, stop eating and drinking, want to be left alone and may become vicious at the slightest provocation. The symptoms become progressively worse. Pupils become dilated, constant growling and barking, disorientation, erratic and aggressive behaviour, compulsion to eat - even inedible items, trembling and muscle incoordination and seizures. In the final stage the dog will appear to be choking, drop lower jaw and lose the ability to swallow. This is when they drool and foam saliva giving rise to the well known "foaming at the mouth" symptom. The paralysis of the jaw throat and chewing muscles spreads to other parts of the body resulting in coma and death. Testing for rabies can only be done post-mortem (after death) using a sample of brain tissue most often with the direct fluorescent antibody test (DFA). The good news is that rabies is entirely preventable. Make sure your dog's rabies vaccinations are always up to date! The canine distemper virus (CDV) affects the respiratory, gastrointestinal, and central nervous systems. It is often fatal and is especially dangerous to puppies 3 to 6 months old and older nonimmunized dogs. The virus spreads through airborne transmission passed in body secretions and excretions especially those from the lungs. Once inhaled it is carried by macrophages to the lymph nodes were it begins to replicate. It starts in the lymphatic tissue and lymphoid organs and soon spreads to the blood and surfaces of the respiratory, gastrointestinal and central nervous systems. Symptoms that develop include fever, shivers and loss of appetite initially, followed by conjunctivitis (discharge from the eye), runny nose, diarrhea, pneumonia (cough, laboured breathing), and vomiting. As the virus progresses and infects the respiratory and gastrointestinal systems bacterial infections also begin to take hold. This is due to immunosuppression caused by lymphoid depletion. As a result pneumonia, encephalitis (swelling of the brain) and hyperkeratosis (thickening/hardening of footpads) takes its toll. Prognosis for this disease is not good. Although some dogs do recover, canine distemper is often fatal. Vaccination is available for canine distemper virus. Just make sure that your dog's vaccinations are always up to date. Canine Parvovirus or Parvo as it is often called is particularly dangerous to young puppies. One relatively rare form of canine parvovirus infecting puppies before or shortly after birth attacks the heart. Heart failure resulting in death can be seen in puppies up to about 8 weeks old. Although puppies gain some protection from their mothers while nursing this is likely to wear off before their immune system is strong enough on its own. This is why it is important to have puppies vaccinated. This requires multiple shots as the puppies immune system makes this transition to become strong enough. Canine Parvovirus is an extremely virulent and hardy pathogen. It has been known to survive outside a host for over a year in both hot and cold conditions. It is transmitted by contact with infected feces, shoes, clothing or any suitable surface. It spreads easily and quickly. It is important to keep infected dogs quarantined from other dogs to prevent further spread. Dogs can remain infectious for 2 months after they have recovered. Unfortunately, not all dogs recover from a parvovirus attack. Once a dog has been infected symptoms will usually begin to show in 3 - 10 days. The virus replicates in the lymphoid tissue in the throat and migrates into the bloodstream. It then attacks cells in the lymph nodes, intestines and bone marrow. This trauma to the system and necrosis (destruction of cells) causes bacteria from the intestines to flood into the bloodstream resulting in sepsis. Visible symptoms include fever, vomiting, lethargy and bloody diarrhea. Due to vomiting and diarrhea, dehydration is a serious threat and aggressive treatment is essential. Even with medical attention there is no guarantee of survival. To protect your pet from canine parvovirus make sure they are vaccinated according to the schedule outlined by your veterinarian. This is especially important for puppies. Tracheobronchitis or kennel cough, is one of the most well know canine ailments. It is a risk for dogs who are in confined spaces with many other dogs such as kennels, shelters and pet stores. This is because it is spread through the air by infected dogs in the area as they cough and sneeze. It can also spread through surfaces that become contaminated. Kennel cough can actually be caused by a number of viruses and bacteria. Kennel cough refers more to the end result than the cause. The symptoms are caused by the trachea (windpipe) and bronchi becoming inflamed. The usual culprits for this are canine distemper, canine adenovirus, canine parainfluenza virus, or canine respiratory coronavirus as well the bacteria bordetella bronchiseptica. In about a week after exposure these infections result in a dry hacking cough, sneezing, discolourd nazal mucous and conjunctivitis (inflamation of the eye). It can also be accompanied by fever, reduced energy and loss of appetite. Pneumonia can also be a risk in severe cases. Fortunately the prognosis is good for dog's suffering from kennel cough. Treatment generally involves administering antibiotics to address bacterial infection and cough suppressants to provide greater comfort. Preventative measures such as disinfecting cages and, of course, vaccinations will help you avoid kennel cough altogether hopefully. Symptoms can last up to 3 weeks so be sure to keep your dog away from other dogs until they are better. Questions About Your Australian Shepherd? Your e-mail address is totally secure. I promise to use it only to send you the newsletter and will NEVER share it with any third party. You can also easily unsubscribe anytime. 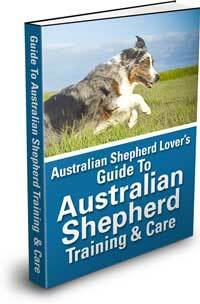 Copyright © 2006-2017, Australian-Shepherd-Lovers.com, All Rights Reserved.